"Tutto e` come si vede dalle fotografie, i padroni di casa sono ospiti deliziosi, la pace e` assicurata anche in pieno agosto. Abbiamo passato una magnifica settimana ed abbiamo gia` prenotato per ilprossimo anno! Grazie ancora ad Eric ed Isabelle." "A stunning villa, with an amazing view. Everything thought out so nicely and Eric and Isabelle were the most generous and warm hearted landlords. I only wish we could have stayed longer." "We had the most amazing time!!! This place is absolutely one of the most beautiful places we have ever been. The owners were so kind we felt at home throughout our stay. We cannot wait to go back." "Everything was perfect, from the comfort of the accommodation to the attentivness of the owners Eric & Isabelle. We were treated to a welcome package of chocolates, wine, biscuits & pasta....all local produce which was wonderful & of a good quality. Obviously some serious thought had gone into it. The Christmas decorations were an absolute treat for us & there were very beautiful indeed. If I had to find any fault, it would be more of a suggestion than a criticism. An electric kettle would have been handy as we are also tea drinkers & had to use a saucepan which was no trouble really, but might be handy for future tenants. Being invited to join the family for Christmas lunch was most unexpected as we thought we were being invited for drinks. How generous of them to share such a special day with us. Although the property was a bit further out of town than we anticipated it was well worth it for the view, standard of accommodation & hospitality of the owners." Our group had five adults (maximum capacity of the villa). Although it didn't bother us (we had a young group), potential renters should be aware that in the second bedroom containing three beds, the bedding configuration includes a bunk bed (ie. one bed on top of another, the third bed was a free-standing single). The villa had awesome views from each room and the wooden outdoor decking took advantage of the prime location and vistas too. As per other testimonials, the villa is about 10 minutes out of town and a car is required to get to and from it (also in a very hilly area). 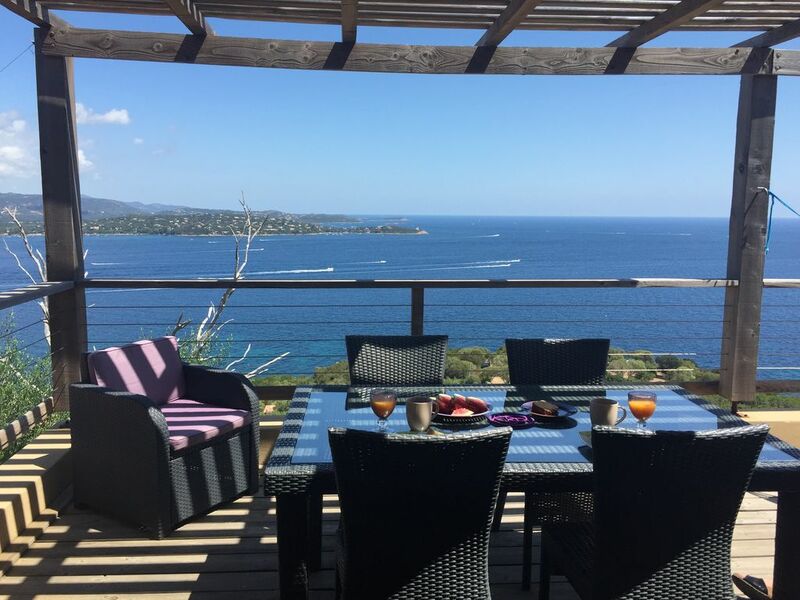 Having said that, many of the other rental accommodation properties we had researched prior to deciding on this villa were also at a significant distance from Porto-Vecchio. Porto-Vecchio itself is a lovely little town and has much more charm and character than any of the other surrounding holiday towns in our humble opinion.... all in all, a lovely area in which to rent. The nearby beach was a little too pebbly for we, Australians (yes... we are spoilt at home with sandy beaches! ), but the famous Palombaggia and sporty Santa Giulia beaches are only 5-10 minutes and 15 minutes, respectively, by car from the villa. A testimonial of this villa cannot be made without making mention of the owners. Their hospitality was fabulously generous and warm. They made sure we found the villa without problems and assisted us in settling in with nice touches such as a welcoming gift of local products. The family was contactable whenever we needed their assistance and responded to any queries promptly. I would have no hesitation in recommending this villa (and this area) to friends. All in all, we had a fantastic stay!" We were the first people to stay in this newly built bungalow. It is situated high on a hill and has a panoramic view to die for. The decor is simple but stylish and the property has been very well designed and superbly equipped with a real eye for detail. We found everything we could have asked for from a built-in safe and outside shower to a hair dryer and dishwasher pellets. We stayed there with our 6 month old baby and found it really well suited to this purpose (baby bath, cot - with mosquito net, changing mat and high-chair). The owner was extremely hospitable and bent over backwards to make our stay as comfortable as possible (including addressing a few small teething problems with friendly efficiency). We would highly recommend this bungalow although having one's own car is really a must as the driveway is extremely steep, there are no shops or restaurants within walking distance and the nearby beach is not nearly as fine as others only 10 minutes' drive away.